I don’t know if you have been following the MERS outbreak in the news but it does raise some concern. The CDC issued a MERS advisory yesterday. July 11, 2015 ABC news story covering CDC announcement of MERS outbreak status. For the last week I’ve been with International Relief Teams on a Head and Neck surgical volunteer mission in Sula, Honduras where we safely completed 120 consultations and 37 surgeries in 5 days. Part of the Internal Relief Team to Honduras 2013 Dr. Whitten is on the right. 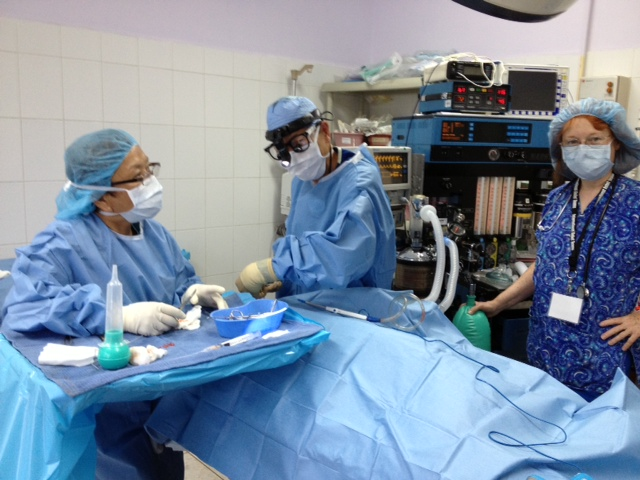 I´m in Honduras with International Relief Teams as part of a Head and Neck surgical team. Here in Honduras, or in any developing country, the power supply can be unpredictable. With the violent lightning storms we´ve been having, the lights have gone off several times in the last few days. Usually the hospital generator starts immediately, but this morning there was a delay in getting the power back on. As fate would have it, the power went out right after extubating a patient from general anesthesia and just as the patient began to vomit. Greetings from Honduras, where I am serving as anesthesiologist for a Volunteer Head and Neck Surgical Team. We are at a small 26 bed charity hospital in the small town of Sula doing many different cases such as tonsillectomies and septoplasties for severe obstruction, and tympanoplasties for chronic ear perforations, among other cases. Doing anesthesia in the developing world is always challenging, as you don´t have all of the equipment, supplies or even medications that you would normally use. Yesterday was a case in point. My anesthesia machine in Honduras gets it´s oxygen from an H cylinder. So in addition to watching all of the other monitors and dials we normally watch, you have to keep one eye on the manometer to make sure you´re is not going to run out of oxygen in the middle of the case.